I haven't completely read manga. But found many differences. Like difference in battles also i saw some new characters in manga.Also in battles the blood has been removed in anime.So which one's better? Yeah there are some differences but they are not consequent. The changes doesn't really affect the story as such. For me, manga is always better. Forever. Why? 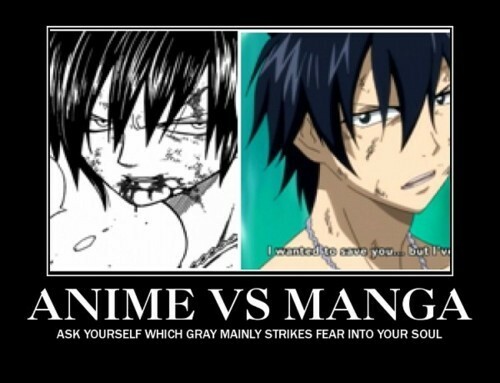 Because manga is original, pure 100 % directly from Hiro Mashima. You can enjoy some scenes that you'll never found in anime. Example, the anime don't show bloods. Manga does. And that's more epic. Anime contains filler—though, until now Fairy Tail only has 8 filler episodes. And sometimes it's getting too much. Example, scene in anime when Natsu and Lisanna in the forest, Lisanna lost, and then in the end Lisanna ask Natsu to find her when she lost again. That's filler. Hiro Mashima never write that. I don't think I need to add anymore, I agree with RedFairyPanda completely. Okay. I think I'll be reading the manga from now on. Starting with Chapter 1!